We had some wonderful times here (see the Tahanea Destinations page) but we also had some ... misadventures. Some of those revolve around the fact that we hadn't been scuba diving since we'd gotten certified in Bonaire, 6 months earlier. We weren't really planning to dive here at all, but 2 of the 8 boats who were here with us had extra dive gear and Greg on Bravo Charlie III offered to loan us 3 sets. 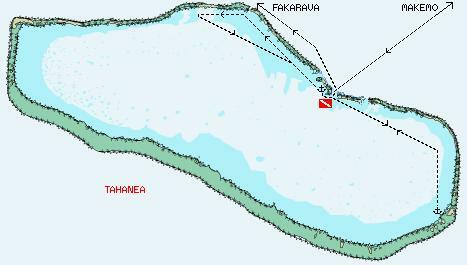 In the end, we did 2 dives here: what we called the Tahanea Anchorage and the Tahanea Middle Pass. In some ways, these could be considered continuations of the same dive, as the first one was so short that we didn't bother refilling the tanks. 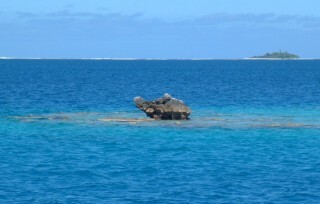 Blacktip reef sharks are usually present. (Jon) We used this a checkout dive, since we hadn't been diving since Bonaire (and even longer for Sue). We just decided to explore a bommie (a coral head rising from the floor of the lagoon to just below the surface - very dangerous for yachts). This could have been an exploratory dive around any of hundreds of lagoon bommies in any of the Tuamotu lagoons. We didn't have scuba gear on board yet, but Greg and Ruth on Bravo Charlie III offered to loan us 3 sets, and we couldn't pass up the opportunity. Amanda took all the rest of us over to the bommie in the dinghy and, after each of us checking the others thoroughly, we splashed into 20'. The swim around the bommie was pleasant, and a good way to get back into diving, but I didn't really see much that I couldn't have seen snorkeling from the surface. Still, it was a good way to get used to all the equipment again. (Sue) My birthday gift dive, first time in over 15 years! It didn't take long to get re-accustomed to the regulator breathing or buoyancy control. This is such mellow diving after N. California in the winter that I was able to easily relax and enjoy the water. The biggest challenge was keeping track of two buddies. We saw lots of parrot fish, angelfish, pennant bannerfish, and a few large groupers. A Lycra skin was ample for the 80 degrees plus water. I was comfortable enough after about 20 minutes that we decided to do the pass dive as the timing was right for an incoming current. (Chris) Diving the bommie was basically the same as snorkeling, except that I could dive (which I love to do) without worrying about holding my breath or coming right back to the surface! I could go down to 40 feet (very deep free dive) and stay there! I could approach fish, follow them, check under ledges, and swim freely. Even though we would not have normally gone diving on a bommie like this one, diving is its own special pleasure. This being the first time in 6 months made extra special. Possible, near the edges, at slack tide. floor into the lagoon, but watch out for the current. (Jon) This dive served as a bit of a wake-up call for us, and we were actually quite lucky that we got away with nothing more than a good fright. Amanda dropped the 3 us off on the outside of the pass as the current was flowing in. We splashed into about 25' and the current immediately grabbed us and sucked us along, into the lagoon. By swimming hard, the 3 of us finally got together and started drifting along as a group. There were lots of interesting hard corals, but they went by pretty quickly. We'd told Amanda to pick us up at the end of the pass. What we didn't realize was the current was pushing us so quickly that we very soon passed the nominal end of the pass. Not realizing that, we stayed down for over 20 minutes. When we eventually surfaced, Amanda and the dinghy were just visible, but a long fraction of a mile away. We called to her (and I can shout a long way) but she didn't hear. We tried swimming back, but the current was so strong that we made little headway, even blowing our BCs up and swimming on our backs. It was already 4pm and the sun was going down and I didn't want to think about what would happen when the tide changed. Would we be sucked out the pass into the big, blue Pacific Ocean? Eventually, Amanda went to the other anchored boats and explained that she couldn't find us. 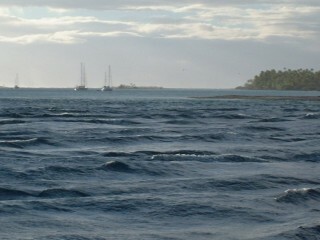 After 2 such trips, we saw several dinghies go to the pass to help look for us. There was nothing we could do except continue swimming. Since I was doing a back-stroke anyway, I decided to fling water in the air as I rotated my arm up from my hip back over my head. As it turned out, the last dinghy to go looking for us decided that the pass itself was well covered, and came to look more in the interior of the lagoon. He noticed what he thought were fish splashing (me throwing water in the air) and we were gratefully rescued. Our total surface time was about an hour (and 3 lifetimes). Tahanea Pass running at a few knots. (Sue) This was a continuation of our first dive, with a surface interval of about 15 minutes. 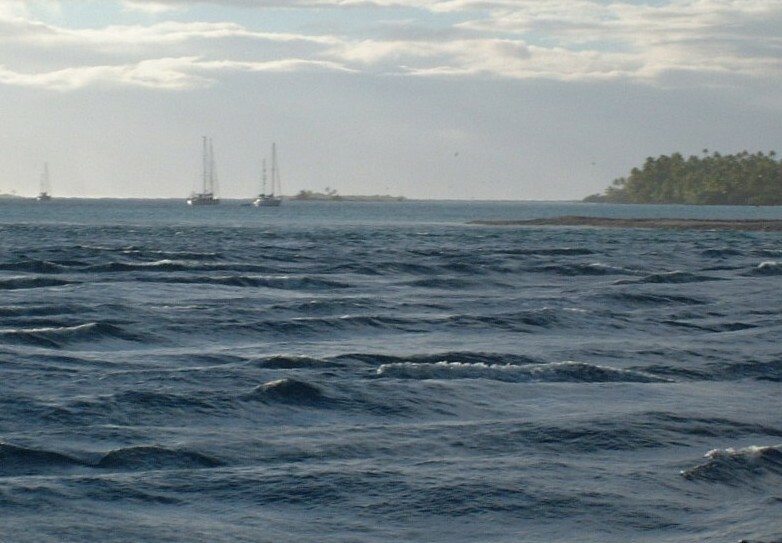 The outside of the pass, on the western side, had standing waves and breakers and Amanda wasn't happy being alone in the dinghy. Jon, Chris and I snorkeled a couple minutes mid-pass to check the flow direction, then dove. We had an incoming current of about 1.5 to 2 knots, maybe more. We dove to 50 feet, then swam to the eastern pass edge and stayed at about 25 feet, where the marine life was more interesting. The deeper, center of the pass was swept clean of coral. There were no obstacles, and with good buoyancy control we could drift along just a few feet over the coral watching the reef fish go by. There were surprisingly few sharks. The other surprise that got us in trouble was that we could not discern the end of the pass by the current. It continued with the same force deep into the lagoon. We should have come to the surface sooner to note our position and get Amanda's attention. As it was, we swam across the current for an hour, barely making headway towards the anchored boats, while Amanda searched for us maybe a half-mile away towards the pass. She finally rallied help from other cruisers and we were picked up, a bit tired, but happy that the current hadn't turned to an outgoing one. The searchers, though, were keeping the pass well covered in case that had happened. What a birthday! (Chris) Well, everybody else has talked about the difficulty in getting back to Ocelot, so I won't talk about that except to mention that swimming hard with a SCUBA unit on your back gets extremely tiring after an hour. What I would rather talk about is how great the dive was! This was our first real dive after getting certified, and our first in many months, so I was really looking forward to it. We started the dive near the middle of the outer side of the pass. The current was perhaps 1.5 knots (which doesn't sound like much, but even with fins you wear out really quickly at that speed) going into the lagoon. It was a little disconcerting seeing the bottom drift past as we descended, but once we reached the bottom it was pure magic. One of the things I had most looked forward to in diving was the 3-D flying feeling where you have complete control, and can go anywhere and do anything. Drift diving somewhat limits your range of motion, (i.e. not upstream) but you get to go past the bottom, a few feet or even inches away (though make sure not to hit anything!) without any effort! It reminded me of IMAX movies where the camera is under a low-flying plane or helicopter, only if you want to go get a better look at something, you can! Safety concerns aside, drift diving in moderate current is pure joy. (Amanda, in chase boat) This dive really freaked me out, and I was only in the dinghy! I guess I just didn't realize what the current was doing forty feet down compared to the wind and current on the surface. It was rather choppy, so I wasn't right with the divers as they descended, so I couldn't get a good look at their bubbles to stay with them. Plus, I didn't really know to look for the bubbles! So I stayed basically in the middle of the pass, a bit to one side, and kept an eye out for any head popping up. No head. No bubbles. No nothing. Fifteen minutes saw me past the end of the motu, so - figuring the combo of wind and current on the surface to be stronger than the current below - I started up the engine and headed back upcurrent a bit, looking for them. Still nothing. I did that every five minutes or so, honestly not realizing the strength of the current, or that there was no way for the divers to tell when the pass ended. Unless the bottom dropped away, which it evidently did not. Forty-five minutes later saw me really freaking out. They weren't there. And they weren't there! Eventually I headed back to Bravo Charlie, nearly in tears, saying that I didn't know where they were. We went out and searched around a bit, before coming back to send out dinghies from all the boats anchored there. The tide was turned by this time, or turning, so most boats started looking outside the pass. Luckily, luckily, LUCKILY, one of the cruisers went WAY inside the lagoon, and saw them splashing water up. There was a very happy reunion on Ocelot after that! Safety Note: We were very lucky to be able to borrow diving gear from another cruiser. Our mistake was in not checking all the attached goodies on the Buoyancy Compensators (BCs). Apparently, each BC was equipped with an inflatable signaling device, which we sure could have used had we known we had them! Also, our dinghy should have had a portable VHF in it so that when Amanda couldn't locate the divers she could have called for back-up assistance instead of having to leave the dive site to rally help. A third mistake was in sending Amanda alone in the dinghy: with a second person someone could have been watching the bubbles closely while the other person maneuvered the dinghy, which can be a full-time job with wind and current.